Abstract. Daily moderate rainfall events, which constitute a major portion of seasonal summer monsoon rainfall over central India, have decreased significantly during the period 1951 through 2005. On the other hand, mean and extreme near-surface daily temperature during the monsoon season have increased by a maximum of 1–1.5°C. Using simulations made with a high-resolution regional climate model (RegCM4) and prescribed land cover of years 1950 and 2005, it is demonstrated that part of the changes in moderate rainfall events and temperature have been caused by land-use/land-cover change (LULCC), which is mostly anthropogenic. Model simulations show that the increase in seasonal mean and extreme temperature over central India coincides with the region of decrease in forest and increase in crop cover. Our results also show that LULCC alone causes warming in the extremes of daily mean and maximum temperatures by a maximum of 1–1.2°C, which is comparable with the observed increasing trend in the extremes. Decrease in forest cover and simultaneous increase in crops not only reduces the evapotranspiration over land and large-scale convective instability, but also contributes toward decrease in moisture convergence through reduced surface roughness. These factors act together in reducing significantly the moderate rainfall events and the amount of rainfall in that category over central India. Additionally, the model simulations are repeated by removing the warming trend in sea surface temperatures over the Indian Ocean. As a result, enhanced warming at the surface and greater decrease in moderate rainfall events over central India compared to the earlier set of simulations are noticed. Results from these additional experiments corroborate our initial findings and confirm the contribution of LULCC in the decrease in moderate rainfall events and increase in daily mean and extreme temperature over India. Therefore, this study demonstrates the important implications of LULCC over India during the monsoon season. 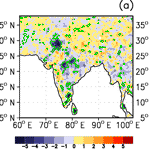 Although, the regional climate model helps in better resolving land–atmosphere feedbacks over the Indian region, the inferences do depend on the fidelity of the model in capturing the features of Indian monsoon realistically. It is proposed that similar studies using a suite of climate models will further enrich our understanding about the role of LULCC in the Indian monsoon climate. How to cite: Halder, S., Saha, S. K., Dirmeyer, P. A., Chase, T. N., and Goswami, B. N.: Investigating the impact of land-use land-cover change on Indian summer monsoon daily rainfall and temperature during 1951–2005 using a regional climate model, Hydrol. Earth Syst. Sci., 20, 1765-1784, https://doi.org/10.5194/hess-20-1765-2016, 2016. Regional climate model (RegCM4) simulations demonstrate that part of the observed decrease in moderate rainfall events during the summer monsoon season over central India from 1951 to 2005 is attributed to anthropogenically induced land-use land-cover change (LULCC). LULCC also partly explains the observed warming trend in the daily mean and maximum temperatures over India. This study demonstrates the importance of LULCC in the context of regional climate change over India.